This property is located A few miles from the attractive town of Shaftesbury in North Dorset just a short distance from the county s border with Somerset. Shaftesbury is a lovely town which will be recognisable to many due to its role in the nostalgic Hovis adverts. Just outside the town is Cranborne Chase Area of Outstanding Natural Beauty once a royal hunting ground it now offers miles of enjoyable walks in the picturesque landscape. For a change of scene to the north of the property is the town of Bruton which has a world-class art gallery chic bistros and fashionable bars: not quite what you d expect from a small Somerset town. Other great days out within easy reach of the property include the town of Glastonbury with its Chalice Well Gardens and atmospheric ruined abbey Longleat Safari Park and the Fleet Air Arm Museum. This property makes a fantastic location for a relaxing couple s break. On arrival guests will find the open-plan lounge/kitchen/diner: a light-filled space with doors opening out onto the patio garden. The cosy lounge area has two comfortable sofas a TV and DVD making it a great spot to unwind after a busy day of sightseeing. The kitchen area which is next to the dining area occupies its own corner of the room and offers an oven hob fridge/freezer microwave and washer/dryer. Upstairs there is one king-size bedroom which benefits from an en-suite bathroom with shower-over-bath and WC. Outside the property has an enclosed patio garden with garden furniture which makes a pleasant place to enjoy alfresco drinks and meals whilst enjoying the peaceful surroundings. Guests may also enjoy a walk around the land where the owners keep their interesting collection of horse-drawn vehicles. There is ample parking close to the property. Christine and Dave are fantastic hosts, nothing is too much trouble. 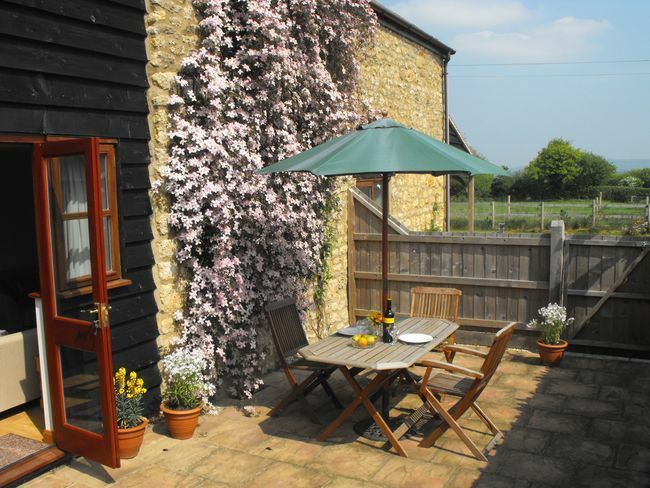 The barn is welcoming, homely and has all that you need for your stay. The shortbread on arrival with choccy chips was very welcome after travelling from London. The views are fantastic, the bed is very comfortable and they have thought of everything. We travelled as far as Winchester in Hampshire, Salisbury in Wiltshire and Seaton in Devon to name a few and they are all easy access. We have been gone less than a day and we already miss it. If we are ever in the UK again we will make every effort to return.